FOE fold over elastic for headbands in Australia. Fold Over Elastic (FOE) Wholesale supplier Australia. 16mm or 5/8 FOE - Over 90 solid colours. We also supply printed fold over elastic. Fold Over Elastic is supper soft and stretchy elastic available in Australia. We can help with your headband making supplies, lingerie or cloth nappies. FOE elastic is perfect for headband elastic and is also great to use as a binding around neck and shoulders on clothing. Fold over ealstic is perfect for baby headbands though to adults. Colours with a number beside are a match to our grosgrain ribbons and many can be supplied in bulk quantities. Make your headbands to size with FOE - Fold Over Elastic made from the finest quality nylon and spandex. how to make fold over elastic headbands. 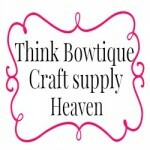 Get the lastest new on Think Bowtique come join us on Facebook. Our prices are in metres.